Def Leppard released their first record The Def Leppard EP in England 40 years ago this month in January 1979. The band had travelled to Fairview Studios in Hull, England in late November 1978 to spend two days recording their very first vinyl release. 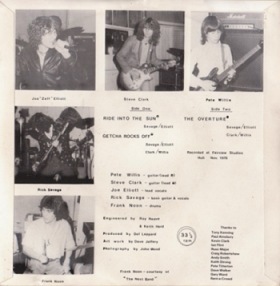 The band's very first vinyl record featured three original songs, 'Ride Into The Sun', 'Getcha Rocks Off' and 'The Overture', and marked the start of their long recording career. 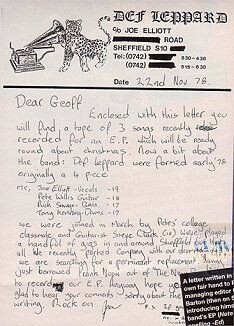 The EP helped to get them noticed in the UK press via journalists like Geoff Barton at Sounds magazine who would eventually come up to Sheffield in June 1979 with Ross Halfin to see them for the first time. Following months of letters from Joe asking him to see them. Joe gave the EP to DJ John Peel who played it on his BBC Radio 1 show. Another BBC DJ Andy Peebles heard the EP and gave the band their first Radio 1 live session. Frank was borrowed from The Next Band specifically for this session after original drummer Tony Kenning had been fired on 18th November. 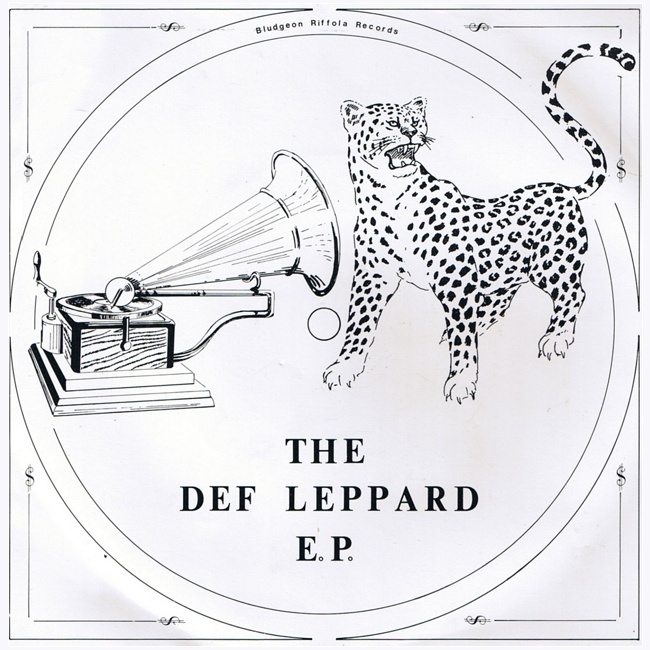 The EP cost £148.50 to record which was borrowed from Joe Elliott Snr. A further £450 was borrowed by Joe from a work colleague to fund the first vinyl pressing and the picture sleeves (stuck together by Joe and his Mum) cost £65. It was first released in January 1979 on their own jokingly titled "Bludgeon Riffola Records" with a red label. The EP was later issued by Phonogram Records as their first ever 7" maxi-single in September 1979 with 'Getcha Rocks Off' as the lead track. Although it was actually track 1 on Side A with 'Ride Into The Sun' moved to track 2 on the same side. This release of the EP is why it is sometimes referred to as 'Getcha Rocks Off' EP or their first single. The EP was issued by Phonogram Records as their first ever 7" maxi-single in September 1979 with 'Getcha Rocks Off' as the lead track. Although it was actually track 1 on Side A with 'Ride Into The Sun' moved to track 2 on the same side. This release of the EP is why it is sometimes referred to as 'Getcha Rocks Off' EP or their first single. Technically speaking the first stand alone 7" single for the band was 'Wasted' in November 1979. The EP was issued by Phonogram Records as their first ever 7" maxi-single in September 1979 with 'Getcha Rocks Off' as the lead track. The first release on the label after signing a recording contract with them in early August 1979. There was no specific release date for the EP. It was not released on the 7th or the 11th or any other date other than the month of January 1979. 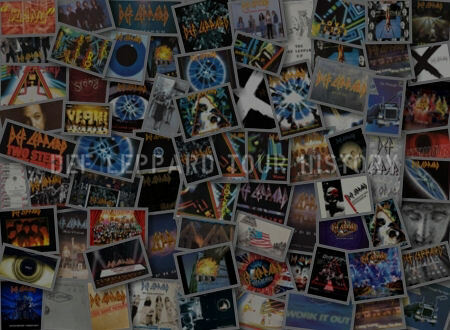 Despite the band adopting the 11th as on official date from an online discography without checking their own archives. In January 1979 they were not signed to a record label or a management team and gave the EP away to friends and sent copies to record labels, radio stations and sold them at venues. The first record by the band that had a release date (also not known) would have been when Phonogram reissued the EP in September 1979 with 'Getcha Rocks Off' as the lead track. That was also when it first charted. The band were not signed to any record label and sent the EP out to radio stations, magazine, journalists. The rest were sold at concerts or given away to friends/family. Read the story of the EP recording sessions along with more recent quotes by Joe from his radio show and interviews. A reproduction of the EP was released in April 2017 as a 12 inch vinyl for Record Store Day . Joe Elliott - "And it was after doing about half a dozen shows in places like schools, pubs, clubs, that we decided that we wanted to make an EP. So we beg, borrowed and stole about 150 quid and we went off to Hull and recorded three tracks." Joe Elliott - "This used to be a shop called Revolution Records. It was used to be owned by a guy called Pete Martin, and when we recorded our EP and we were looking for somewhere to distribute it, I came in here and said 'Any chance of you selling our record for us?'. And he said yeah no problem. ."
Pete Martin (MSB Management) - "And I proceeded to sort of like hand them out to PR guys, record company reps. Promotion guys and things to pass on to the A and R department. And Frank had a copy." Frank Stuart-Brown (MSB Management-since deceased) - "And I just played it at home in a few quiet minutes and it was halfway through the B-Side. Which I can't remember the title of at the moment. It just dropped on me like a ton of bricks. It reminded me a bit of Yes. The early Yes from Fragile. And I phoned Pete up within about half an hour. I just sat there shaking for a while." Pete Martin - "And Frank wanted Joe's address. I said no, you're not having it because I didn't think that Frank should manage the band. I didn't think he had the capabilities of doing it on his own. OK he was a great PR guy but he didn't know enough about the business. So then Frank offered, he said well why don't we work together. You can do the music side and the hype and combined we can more or less know enough to get it done and do a really good job." Joe Elliott - "We needed press publicity and the best known rock magazine at the time was called Sounds. So we pestered their chief writer Geoff Barton to come and see us in Sheffield." Geoff Barton - "The demos that Joe had sent me down you know sounded very professional for a band of their particular youth. But obviously seeing a band live is a whole different ball game." Joe Elliott - "We needed radio airplay too and a disc jockey called Andy Peebles heard our EP in Frank Stuart-Brown's car on a journey from Leeds to Manchester." Andy Peebles (ex-BBC Radio 1 DJ)- "It's the old story. You get in a car. Somebody's offering you hospitality and inevitably because they're in the business the next line is 'Look, I've got this tape I'd like you to listen to'. And Geoff Griffin my then producer at Radio 1 and I both sort of looked at the roof of the car and went 'Oh no!'. And on goes the tape because we couldn't really do anything else. And I mean I'm very glad in hindsight that we did. And within about 12 bars of the first track we heard. Which was Def Leppard in the very early days. Geoff and I were just looking at each other going 'Wow' or whatever came to mind. And we listened to about three of four songs and to put it briefly were immensely impressed with what we heard." "As I said the programme encompassed all sorts of music. So I was quite happy to play the sort of music they were performing at the time. Which to be fair hasn't changed that much although it's much more sophisticated now. And at the end of a sort of conversation after we'd listened to the four tracks Frank said what do you think?. And Geoff Griffin said immediately 'They're very, very good. And I'd be interested in inviting them down to the BBC Studios in Maida Vale to record a session for us.'. And history will relate that that's exactly what we did." Enclosed with this letter you will find a tape of 3 songs recently recorded for an E.P. which will be ready round about Christmas. 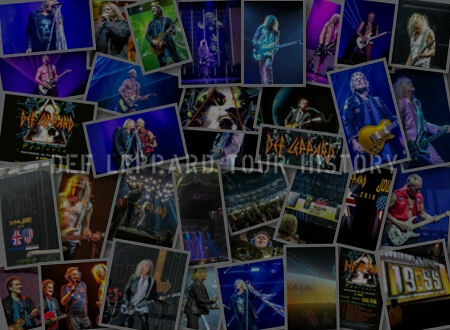 Now a bit about the band: Def Leppard were formed early '78 originally a 4 piece. We were joined in March by Pete's college classmate and guitarist Steve Clark (18). We've played a handful of gigs in and around Sheffield but that's all. We recently parted company with our drummer and just borrowed Frank Noon out of "The Next Band" to record our E.P. Anyway hope you like [missing] glad to hear your comments. Sorry about the [missing] writing. That was it. Def Leppard scrambled to find a drummer for the next week's recording session and Tony Kenning went on to work as a technical officer at British Telecom. He also formed his own band, Cairo, a pop-rock quartet which released an independent single in 1984, Eight Bells b/w Inside Out on their own Pyramid label. And as of mid-'85, Cairo were rehearsing in a room in the old spoon factory complex, although rates had gone up considerably, from £5 a week to £122 a month. In a panic over the upcoming recording session, Joe called Frank Noon, the drummer with a Sheffield-based trio called the Next Band, asking if if he could pitch-in for Tony. Noon was an obvious choice. He was an acquaintance of the Leppards and the Next Band had been the chief inspiration for the recording idea. They had recorded their own independent EP, cutting it on the cheap and selling it at gigs. One night previously at the Wapentake, Joe had cornered Frank and pressed him for information about the EP. Where did they record it? How much did it cost?. Frank recommended the inexpensive little recording concern, Fairview Studio in Hull, where the Next Band had recorded their record, Four By Three, in September '78. Joe, in return for the info, helped sell a few Next Band EPs around Sheffield. With barely a week's notice Frank Noon agreed to sit in for the session. Choosing material was no problem. Def Leppard had a wealth of originals rehearsed and ready to go. Overture captured everything that set Leppard apart from regulation British hard-rock - harmonies, intricate guitar arrangements, ambitious melodic structures. Getcha Rocks Off was a speedy invitation to a party hearty, a natural headbanger's anthem. 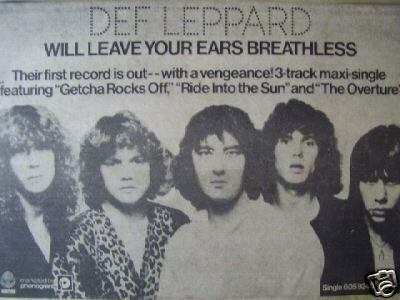 To lead off the EP, Def Leppard elected to go with Ride Into The Sun, a Savage-Elliott number stocked with solid commercial hooks. That would be the bait for radio DJs, if they ever got around to playing the record. The song selection also ensured that guitar solo duties were doled out evenly. Ride Into the Sun was Pete Willis' showcase; Steve Clark handled Getcha Rocks Off. They both shared the spotlight in Overture. "That way," Steve says, "we could both be the stars for about thirty seconds." The Fairview sessions took place on November 25 and 26, a Saturday and Sunday. Andy Smith arranged for cheapo accommodation at a bed 'n' breakfast place near the studio. 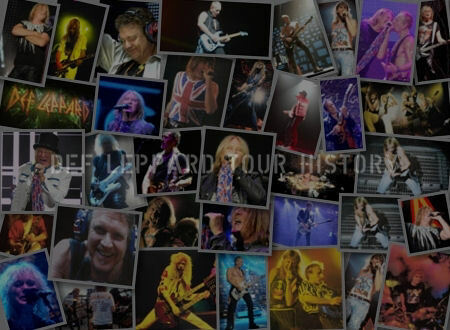 Def Leppard arrived at Fairview - an hour's drive from Sheffield - on Saturday morning, set up their equipment and tested sound balances with house engineers Roy Neave and Keith Herd. It took four takes to get the backing track of Ride Into The Sun down because Frank kept switching the tempo around the wrong way during the unusual seven-beat finish. Leppard then whipped through the basic track for Getcha Rocks Off in one hot take, although Pete Willis momentarily went into the wrong key at the end (quite audible on the record). 'Overture' was also a one-take triumph. The rest of Saturday was take up with guitar overdubs and Joe's vocals on Ride Into the Sun and Getcha Rocks Off. After much celebratory drinking and assorted merriment that night, Joe returned to Fairview Sunday afternoon to tackle his Overture vocals. It took six takes to get right Joe's big scream in the final thumping climax. 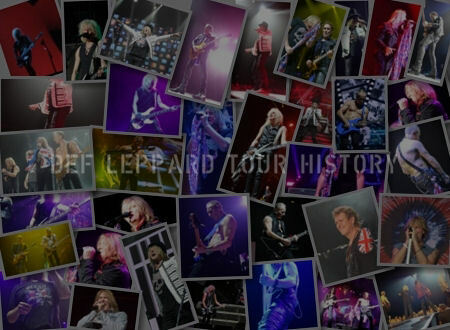 Read more about The Def Leppard EP recording as posted in November 2018.